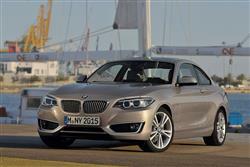 Find out everything you need to know on the new BMW 2 Series from independent vehicle review website Car And Driving. You can watch the video review to the left to see more of the car or read their written review below to get a true insight from an expert in the automotive industry. BMW demonstrates that coupes can have a sensible side with its 218d. Jonathan Crouch reports. BMW's best 'real world' car might well be the 218d Coupe. You get the typical BMW coupes compactness, lightness and rapid responses of a good BMW coupe yet prices start at less than £25k and economy is rated at 62.8mpg. That's quite a span of talents. Start seriously thinking about buying a new car and you'll very quickly arrive at a stark realisation. Your money doesn't go very far. By the time you've added options and on-road costs, you begin to realise that the monthly repayments have stacked up so far, all you'll be able to do is polish the thing and protect your residual values which defeats the object of buying a car in the first place. The ideal package would be a good looking car that was fun to drive, kept hold of its value well, was so economical you'd drive it just for the fun of it and which gave you a kick to own. Oh yes, and didn't cost the earth to buy. That sort of wish list has often remained just that, idle wishes, but with the launch of the 2 Series Coupe, BMW has brought a car to market that might just fit that bill, especially in 218d diesel form. Priced from less than £25,000 and shot through with all of BMW's engineering right stuff, the 218d looks the real deal. Okay, so a 218d doesn't exactly sound as if it'll melt tarmac. Under the bonnet is a 2.0-litre diesel engine that's a detuned version of the 190bhp unit found in the 220d. In this guise you get 150bhp and 320Nm of torque which isn't at all bad. By contrast, a Volkswagen Golf GTI makes 350Nm so you're not too far off that sort of overtaking muscle. The 218d is quicker off the line than you'd expect for a diesel too, getting to 62mph in just 8.4 seconds and running onto a top speed of over 130mph which means that you won't find yourself rowing the thing along the outside lane of the M1. These BMW two-litre diesels might be brawny but they're not the most refined engines in the world and they are vocal when you really open the taps. Many drivers will be tempted by the optional adaptive dampers at £750, and they work particularly well on UK roads in Comfort mode, giving a decent suppleness to the ride quality. Even in Sport mode they're usable on a B-road. The 2 Series chassis is communicative and signals its limits of grip really well. You're always aware that drive is going to the rear wheels when piloted enthusiastically and the steering is one of the better electrically assisted setups in its class. Where the 1 Series Coupe was a purposeful but slightly gawky-looking thing, the 2 Series is an altogether more cohesive piece of penmanship. The dimensions are also a little more generous, adding 72mm to the overall length, 26mm to the width and slicing 15mm off the overall height. Lower, wider and longer tends to equal sleeker. The glasshouse is also a lot more elegantly integrated into the fuselage. In fact the chassis is a modified and slightly shorter version of the 3 Series' underpinnings and it shares its bonnet, front wings and doors with the three-door 1-series. The front end features a broader kidney grille and more aggressive air intakes. Moving back you'll find swept up side skirts, some deeply-surfaced flanks and tight overhangs. Inside, it's much as you'd expect, with improved build quality, with more substantial plastics used throughout. BMW's much-improved iDrive system features and now includes a higher definition 6.5 inch flat screen. Access to the rear and legroom once you're back there is a good deal better than the 1 Series Coupe and shoulder width has also been improved. The boot is a useful 390-litres. Prices start at just over £24,000 for the SE model with manual gearbox. We've waxed lyrical on the qualities of the ZF eight-speed automatic transmission before and this tacks on around £1,600, bringing with it incremental improvements in economy, emissions and performance. You'll pay another £1,000 over the SE model for Sport trim and another £1,400 again for M Sport equipment, which means the range-topping M Sport automatic will ask just over £28,000 of you. That's still not exorbitant. You can pay over £26,000 for a Honda Civic diesel these days. It's slightly odd that a car that looks so instantly a winning proposition comes with no direct rivals. What else is there that offers this sort of economy and punchiness, in a coupe body that sends drive to the rear wheels? There really isn't anything that directly squares up to the 218d. That doesn't mean that BMW has soft-pedalled on its development though. Viewed in isolation, the 218d's fuel consumption and emissions figures are outstanding. The manual car returns 65.7mpg and emits just 139g/km while if you stump for the ZF auto 'box, you'll do even better. But here's the thing. The much more powerful 220d coupe is only around £1,600 more model for model, and that seems great value for a whole 40PS more power and economy that's hardly any different. Of course, the alternate view might be that the two cars are so similar that the 218d is what software people would call 'crippleware', a package that's deliberately hobbled to make you spring for the more expensive option. Whatever way you look at it, the 218d is fitted as standard with an Auto Start-Stop function available on both manual and automatic transmissions. An ECO PRO mode, activated using the Drive Performance Control, is a new feature on BMW's that adjusts various on-board systems to maximise efficiency. When in ECO PRO mode the throttle response is adjusted to encourage a more economical driving style. The extra economy created in ECO PRO mode is fed back to the driver, with the in-car displays showing the additional number of miles achieved. There aren't too many cars from major manufacturers that are so singular in their blend of talents that they have no direct rivals, but the BMW 218d coupe is one. Go on. Name another diesel, rear-wheel drive coupe that competes head on? Perhaps this car's only real rival comes from an internecine threat, the 220d. It seems very tempting to spend a little more on a significantly more powerful model, but BMW's trim walk-up is designed to do just that, to convince you that you need an M Sport rather than an SE until you're spending upwards of thirty thousand. Part of the 218d's charm is that it can be relatively inexpensive. Handing over just over £24,000 for the entry-level car represents a bargain for a car so cheap to run and enjoyable to own. Of course, you can buy quicker cars for the money and you can get more economical ones, but few have such a combination of tactility, elegance and cost-effectiveness as the 218d and that's what makes this car so appealing.